Superannuation is often an ‘out of sight, out of mind’ proposition’– as long as you are getting the required 9.50% paid into your superannuation fund then you don’t really need to worry about it until you retire. However there are a number of cost effective insurance options that are available within your super fund, particularly around total and permanent disability cover. How do I take out TPD through my super fund? 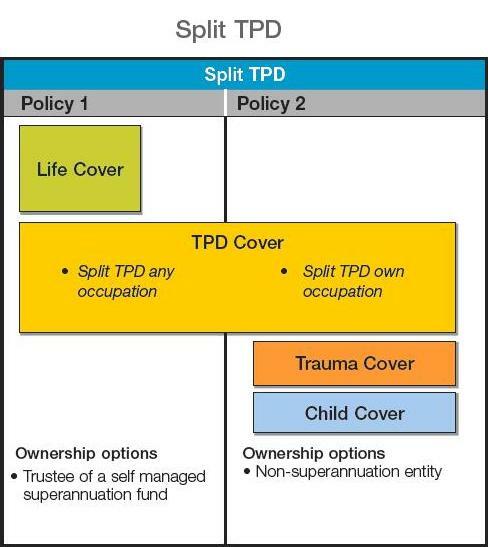 Taking out TPD through your super fund, is the same process as if you were taking out a normal TPD policy except in this instance, the super fund becomes the policy owner. Premiums may be tax deductible to your super fund. Management of cash flow as premiums are paid for by your fund rather than after tax income. Discount of up to 8% for annual premium payment. Certain TPD definition may not be able to be taken out through super. Premiums can erode retirement savings. There can be difficulties accessing your benefit. If you wish to take out TPD through super there are a number of structuring and ownership options available to you. Also available for policies held outside of super, you can elect to combine your TPD insurance with Life Insurance, Trauma Insurance or both. Combined policies can be a great way to take out multiple cover types at more affordable premiums. 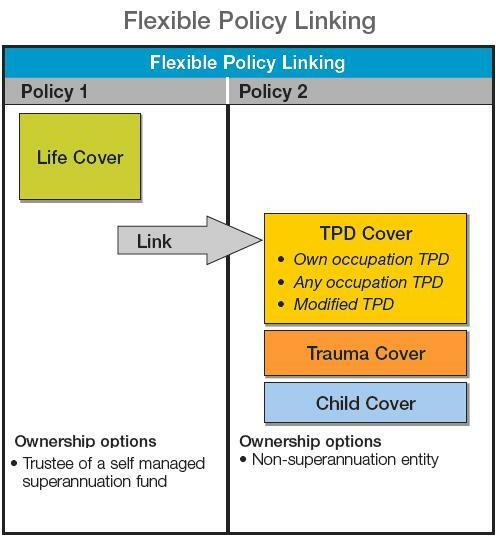 You can hold an individual TPD policy within super that is not linked to life insurance or any other type of cover. Flexible linking policies take the combined policy approach a step further and allow you to split the policy ownership between individual and super ownership. This allows you to hold life insurance in super and TPD insurance outside of super, while still taking advantage of savings of a combined policy as shown by this example below. One of the limitations of taking out TPD through your super fund is that Own Occupation TPD, which provides cover for your own specific occupation, is unavailable to be taken out through super. Insurers have made another option available where you split your TPD policy between super ownership and self ownership. Provides coverage across Any and Own Occupation definitions. Any Occupation Premiums are tax deductible to your fund. If you have a Split TPD ownership structure, your insurer will generally assess the claim using the Any Occupation definition first. If this doesn’t apply, it will assess your claim using the Own Occupation definition. Implications of Policy Ownership and the release of funds. When taking out personal insurance as part of your superannuation, the fund becomes the policy owner, meaning any benefit paid out gets paid out to the fund, rather than the individual, as opposed to policies held outside a superfund, where the individual is the owner. With the benefit being paid out to the fund, in order for the individual to access this benefit and have the funds released, a condition of release would need to be met. In order for this condition to be met, the insurance type definition had to meet a strict condition of release as outlined by Superannuation Industry Supervision Act. Generally, while the Any Occupation definition will meet the conditions of release, the Own Occupation definition may not meet this condition unless the disablement is so severe that they are permanently incapacitated and they are unlikely to ever be able to work in any occupation for which they are reasonably suited for by education, training or experience. This means that unless the Any Occupation definition is met, any benefit paid out to the fund may not be available to the individual, until a condition of release is met. You could take it out part of a combined life policy within your super but only include the Any Occupation definition, sacrificing the opportunity to include the Own Occupation definition. You could take it out as part of a combined life policy within your fund and use the Own Occupation definition but risk being unable to access those funds until a condition of release is met. You could take out two policies – a life policy within your superannuation and a separate TPD policy held outside of your fund, allowing you to include the Own Occupation definition. Generally, while holding two separate polices will make premiums more expensive than if you held a combined policy, your life cover would not be reduced if a total and permanent disability claim is made, as per the guidelines of a combined policy. In addition, by holding Total and Permanent Disablement insurance outside of super, any benefit paid out is not tax assessable. In light of the difficulties around policy ownership and the release of funds, the life insurance industry has taken a number of steps in recent years in attempting to make TPD within your SMSF/superannuation easier and more cost effective. While the Any Occupation definition generally meets the condition of release, the Own Occupation definition may not meet this condition unless the permanent disability is so severe that they meet the permanent incapacity definition and it deemed that you are unlikely to ever be able to return to any occupation for which you are reasonably suited for by education, training or experience. Unless this occurs, any lump sum benefits paid out to an Own Occupation policy owned through a SMSF may be locked up within the fund until you reach retirement age or another condition of release is met. In general, premiums for total and permanent disability policies are not fully tax deductible within your fund unless the cover meets the any occupation definition. For further information on tax deductible premiums, please visit the TPD and Tax section of our website. John is 45 and works as a lab technician. He takes out a combined policy through his superannuation with Life Cover of $500,000, Trauma Cover of $200,000 and Total and Permanent Disablement Cover of $400,000. As part of the combined policy, he splits his TPD with the Any Occupation cover being owned through his fund and the Own Occupation cover owned by him individually. Unfortunately John is involved in an accident which leaves him unable to use his arm. John raises a claim with his insurer, who first assesses his policy using the Any Occupation definition. As John is still able to do another occupation, his claim under this definition is rejected and moves across to the Own Occupation definition. Under this definition, he is successful in his claim and as the policy is owned by him individually, he is able to access his lump sum payment of $400,000. Due to this payout, his sum insured for his life insurance policy decreases to $100,000. Compare TPD insurance quotes online in less than 60 seconds. Easily compare disability insurance from some of Australia’s leading life insurance companies.